The mainstream media often climb onto certain narratives that take off as memes for one reason or another and become conventional wisdom, but often the standard narrative does not accurately represent what is really going on. For example, much of the recent media coverage about the U.S. Cuba travel market, especially regarding flights, has followed the story line that the market is not as strong as had been expected. However, that misses a great deal of the real story. 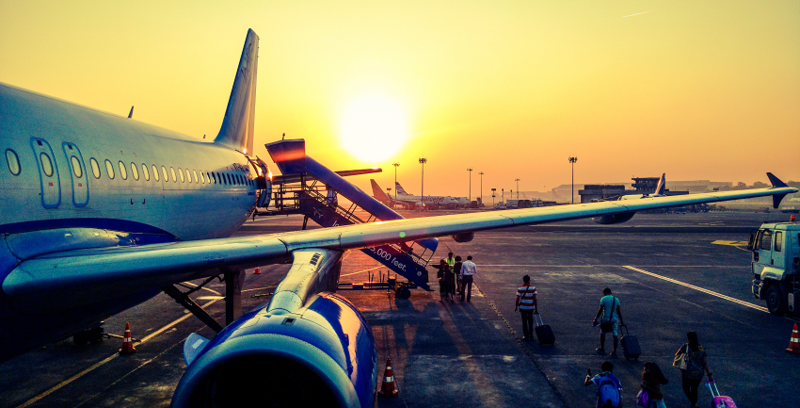 It should be made clear, that U.S. travelers can legally fly from the U.S. to Cuba on well-known U.S. commercial carriers including American Airlines, Delta Airlines, jetBlue, Southwest Airlines, and United Airlines. Unfortunately, an accurate picture of the Cuba airline market is hard for most people to see because travelers are not able to purchase or view available flights to Cuba on online travel agents (OTA’s) such as Expedia, Orbitz, or TripAdvisor due to U.S. Department of the Treasury regulations. Unfortunately, and as a result, travelers who are used to researching and purchasing air fare via one of the OTA’s might assume that flights to Cuba are not available. But in this, as in so many other ways, Cuba is an exception. To find available flights to Cuba, travelers need to book directly on the airline website or with a travel agent who has access to their booking systems. However, you need to know which airlines provide service to Cuba to know where to start. Those who book with a tour operator can take advantage of the operator’s knowledge of the market to find the most suitable flights. But those who are browsing the market are only going to get part of the story. Some in the media reported that airlines were pulling out of the Cuba, while in reality the U.S. airlines were adapting to what was a virgin market less than three years ago and actual demand. While some airlines did reportedly pull service, others took their place, and even expanded service in markets where demand was higher and made more sense. The net result for travelers wanting to fly to Cuba is that they are more accessible and affordable than they ever have been. New markets have opened including non-stop service from Boston and Houston, and the five airlines that service Cuba have taken over some of the routes that other airlines released. When President Obama announced in January 2015 that commercial airlines would be allowed to fly to Cuba again, for the first time since 1962, the airlines had to rush to apply for flight routes with the U.S. Department of Transportation. They had to guess how many flights to offer, which cities to fly from in the U.S., which cities to fly to in Cuba, the size of the aircraft, and more without any historical market data. After commercial air commenced, the airlines expected to adjust their offerings to what the market would bear. But in the case of Cuba that too was more complicated than expected. Travel to Cuba is perennially used as a political football by U.S. politicians, and the market is always subject to sudden and drastic changes coming from the interference of politicians. When President Trump announced he was “canceling” Obama’s policies toward Cuba, it threw confusion into the marketplace, despite that little actually changed, and everyone involved in Cuba tourism, including the airlines, had to adjust accordingly. Meanwhile, things have shaken out in the airline market after its initial period and today Americans have a great menu of offerings for flying to Cuba. Here’s a quick survey of what the commercial U.S. airlines are now offering for flights to Cuba. There are currently five US carriers servicing Cuba including American Airlines, Delta Airlines, Jet Blue, Southwest Airlines, and United Airlines. They all fly into Havana and all offer non-stop service from cities in the U.S. including Atlanta, Boston (Nov 2018), Charlotte, Fort Lauderdale, Houston, Miami, Newark, New York, Orlando, and Tampa. See the chart below. There’s also connecting service from any airport the five major carriers service. JetBlue and Southwest Airlines regularly offer special fares from Fort Lauderdale to Havana with Southwest offering special low-priced morning getaway fares from Fort. Lauderdale to Havana for as little as $89 one-way. Flights from New York’s JFK to Havana are often $350-$450 round trip, non-stop. 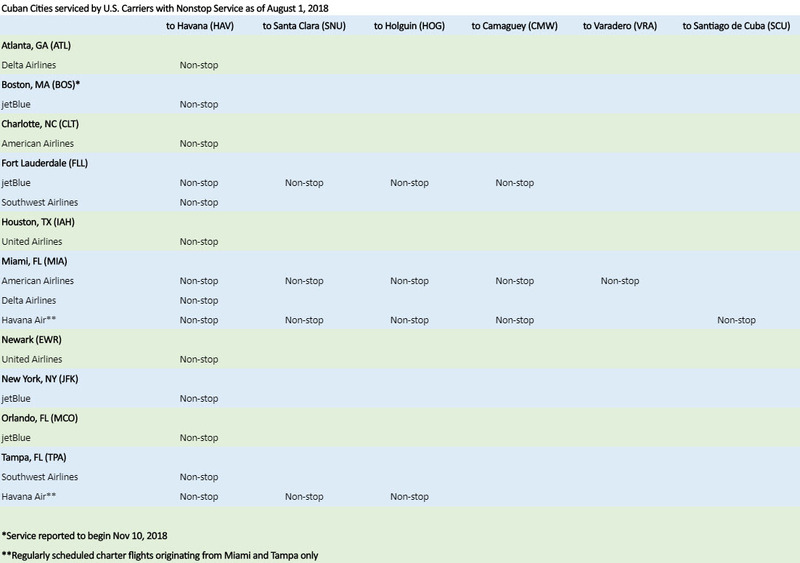 At the time of this posting, flights are available on United from San Francisco to Havana for about $450, Chicago to Havana starts at $250, and Denver to Havana for $302, all requiring a connection and are one-way. Non-stop flights from Boston to Havana on jetBlue will start around $400 round trip and will begin after November 8, 2018 but you can book now on jetblue.com. American Airlines offers five flights daily from Miami so wherever you’re coming from, you can get to Havana. Delta surrendered its non-stop flight from New York’s JFK to Havana to JetBlue in February, which is still offering daily non-stop flights from New York’s JFK to Havana. However, Delta Airlines still offers flights to Havana from Atlanta and Miami, and just announced additional service from Miami to Havana. The prices of flights to Cuba have also greatly improved since the advent of commercial air to Cuba and other market forces. For example, in the days before commercial flights to Cuba, and with a combination of domestic flights and a charter flight, it could cost travelers $800-$1,000 to fly to Cuba, unless you lived in Florida. It also often required an overnight in Miami. Today, most passengers can fly from numerous destinations in the U.S. to Cuba for $250 to $450 round trip, and U.S. travelers are taking advantage of these fares to visit a country that was once off-limits for more than 50 years.